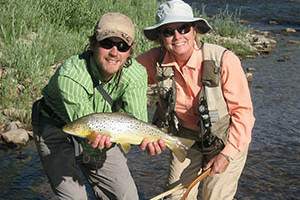 Fish the San Miguel, the Lower Delores, the Uncompahgre or Gunnison with our exceptional & experienced fishing guides. We offer trips to alpine lakes and private water too! Some lakes near Telluride are accesible by car, while others require long hikes in. Two lakes -- Woods and Trout -- are only a half-hour away and are great for day-trips. The season near Telluride is short, but regional lakes can be fished year-round. The alpine lakes surrounding Telluride have a little something for everyone. Several lakes are accessible by car, while others require a full day of hiking. This makes it easy to find the right conditions depending on your experience and ambition. The high-alpine lakes can be difficult to reach, but offer rewarding scenery and big fish. Road-accessible lakes can be (relatively) crowded with campers and anglers, but are great for easy day-trips and novice anglers. Bottom line: seek and you shall find! The fishing season in Telluride is relatively short because of the cold winter, but regional rivers and lakes at lower elevations can be fished year-round. Alpine lakes become nearly inaccessible when the snow starts falling heavily in middle to late November. It is not uncommon for heavy snows to continue into late April, and “mud season” usually comes to an end in June. Home to a National Forest Campground, Woods Lake is a great lower-elevation option for the beginner to intermediate fly or spinner fisherman. Go 12 miles West on Hwy. 145 from Telluride, turn left at Fall Creek Road, then head 8 miles up the dirt road. Aptly named, Trout Lake sits at the base of 14,000 foot peaks and can be fished from the shore, with waders, or by boat. This is a relaxed and serene lake with plenty of fish and easy access. Head south on CO-145 for 10 miles, lake is on the left. Silver Lake is a truly breathtaking high-alpine lake worth the somewhat challenging two-hour hike from Telluride. The hike is roughly 5 ¼ miles roundtrip and covers 2,000 vertical feet. Hook a fish here, though, and you won’t forget it. Access trail starts at Bridal Veil Falls east of town. Alta Lakes – Six miles south of Telluride on CO – 145. Ridgway Reservoir – Just outside Ridgway toward Montrose. Miramonte Reservoir – Near Norwood. McPhee Recreation Area - 65 miles southwest of Telluride near Dolores and Cortez. There are several outfitter and guide shops in Telluride, and they will often know where the best conditions are. Fishing in the area does require a license, which can be bought at many of the local sports shops. Always ask about the release policy, as it can vary from location to location.